A Step Above Stairs and Rails is a privately owned and operated business that has served South Florida’s most up and coming communities since 2004. We combine the best quality products and materials, with great talent and craftsmanship to provide builders and homeowners with the best quality stairs and railings in the market. From renovations to upgrades, to new construction, and everything in between, A Step Above has the experience you have been looking for. We invite you to browse our gallery of projects and see for yourself. If you have any questions, or simply wish to request a free estimate, do not hesitate to contact us. 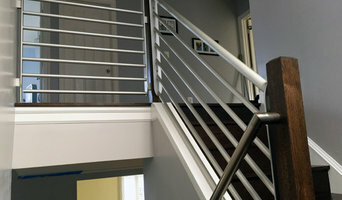 Green Oxen is an architectural solutions company providing railings, doors, and baseboards of American made aluminum that fuse function with modern design. Architects, interior designers, and modern living enthusiasts can rely on Green Oxen as a source for robust, dependable, eco-friendly, and stylish architectural products. "Exquisite stairs and rails, limited only by your imagination" At The Stair Company, we understand your desire to showcase the masterpiece you have dreamed of - and we appreciate the opportunity to bring that dream to life for you! Our designers and installers understand that whether you are remodeling an existing piece, or starting from scratch, you want perfection. And why not? A staircase is part of your home's identity, bringing character, elegance, pride, and even value to your home. 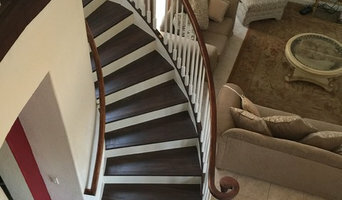 The Stair Company specializes in customized residential and commercial stairs and rails, and our professional and educated staff has been building extraordinary structures for over 35 years. Our quality workmanship has earned us a reputation as one of South Florida's premiere contractors. We specialize in custom staircases and railings - from concept to completion - and we are experts in wood or steel constructions. Here at Xclusive Rails and Fence Inc., we take pride in providing the best services and satisfying our customer needs. Full service custom ornamental metals manufacturing company located in Miami, FL. In business since 1969 providing hi-end authentically hand forged metalwork. Harmoniously elaborate scrollwork to clean, contemporary styles. We provide design services for designers and end users as well. Toledo Iron Works was founded by Gregorio Suárez, and his son Guillermo Suárez Sr. in South Florida in the late 60’s. Gregorio was originally a Jai-Alai player, whose extensive trips to Europe at the early part of the 20th century opened up a thirst for creativity. Taking advantage of his popularity in Jai-Alai, Gregorio was able to secure apprenticeships in the world of blacksmithing. He continued to learn and master this craft throughout Spain and Italy under the watchful eye of the greatest masters of the time. Real Royal Renovations LLC is locally owned and operated business. We are specialized in custom trim and finish carpentry for residential and commercial projects. We are able to meet demanding projects involving all kinds of Staircases, Wood Floors, Interior Doors, Baseboards, and Crown Moulding. We provide quality workmanship, reasonable rates and friendly customer service. 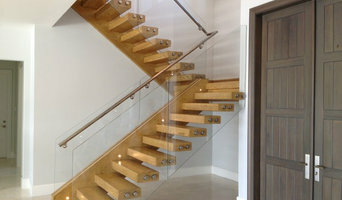 Bella Stairs, LLC was founded in 2010 with the goal of providing the finest glass stairs available to the U.S. market. We are a distributor of fine designer stairs and railing products, specializing in high-end designer stairs and railings. With material choices ranging from glass, wood, stainless steel, marble, granite, among many more combinations, Bella Stairs caters to custom designer stairs in both residential and commercial spaces. We will work hard to custom design stairs to meet the specifications and aesthetics you desire. L&L Ornamental Aluminum and Ironworks, Inc.
L&L Ornamental Aluminum and Ironworks is committed to producing the finest quality ornamental aluminum and ironworks by providing superior design, expert fabrication and installation, accurate replication and conscientious restoration in a wide range of metal alloys, finishes and architectural styles. L&L Ornamental operates a 10,000 square foot design and production facility, which has the equipment necessary to execute architectural metalwork of any size or complexity. We also offer a wide range of finishes including powder coating, wet paints and faux finishes. The vision of Ambiance Interiors MFG (AIM) is to become the leading provider of state-of-the-art stairs and railings systems in the United States and abroad. 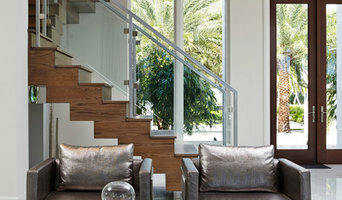 Established in 2000, AIM was founded as a small family-owned boutique railings company; today, AIM is a leader in the South Florida market grounded on the same principles since its inception more than a decade ago – offer unsurpassed customer service and high-quality products at a competitive price. AIM’s portfolio includes a full line of stairs, railings, balconies, fences and other related products varying from classic to contemporary. AIM’s commitment is to help its customers find the right balance between aesthetics and structural functionality. AIM’s qualified team and leading edge technology is a competitive advantage in the industry. AIM’s main asset is its selected group of experienced professionals, formed by architects, mechanical and structural engineers, a certified building contractor, and certified welders between others. Throughout its years in business, AIM has created devoted relationships with local and overseas suppliers. Among other materials the company specializes in are stainless steel, glass, aluminum, wrought iron, steel, bronze, brass, wood and titanium. Stair Builders of South Florida is the leading custom stair company in all of Florida. Combining old-world craftsmanship and modern techniques, we create beautiful and durable staircases out of wood, stainless steel, and glass. We build each staircase to perfection by focusing on the smallest of details and what our customers envision. David Viera LLC has been manufacturing the highest quality of STAIRCASE RAILING products and components for over 12 years in Miami Dade, Broward and West Palm Beach. We work directly with owners, builders, contractors, architects and interior designers to bring their visions to reality. We are dedicated to supplying the international and local market with decorative stainless steel designs and treated glass for innovative architectual systems. With more than 20 years experience we strive everyday to convert our knowledge into creative functuinal designs and providing our clients with good quality service at competitive pricing.